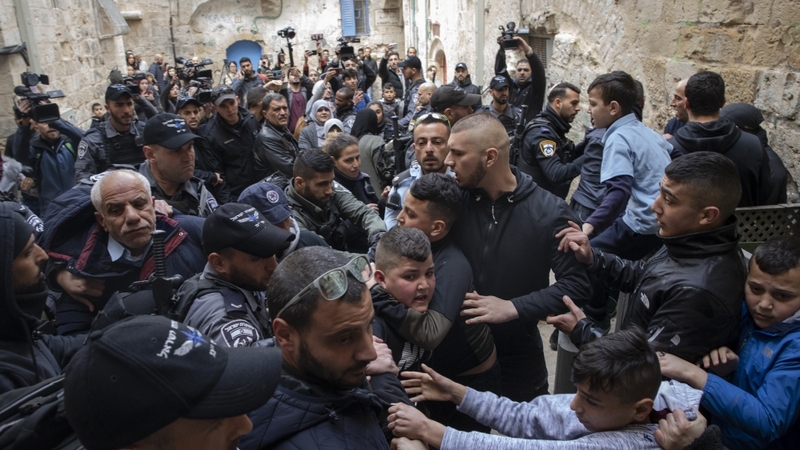 On Sunday, the Israeli police issued a Palestinian family from their homes in the Muslim quarter of Jerusalem's old town, after the Supreme Court ruled Jewish settlers were the rightful owners. An AFP photographer said residents of the Israeli occupied East Jerusalem were hit by the police, who stood guard as if half a dozen Israeli settlers took possession of the large building. Rania Abu Assab, who lived in the house with her husband, their children and his aunt, wept outside as the settlers raised the Israeli flag on the roof. "We live there, it's my house, it's my whole life," she said. "They took everything." She said the family was forced to leave all their furniture and belongings. Her husband Hatem and son Mehdi were arrested by Israeli forces after they were physically assaulted, witnesses said. Ir Amim, an Israeli watchdog group that monitors settlement activity in Jerusalem, reported it On February 3, the Abu Assab family had been served a statement that ordered them to leave the residence on February 28. 960s, but Palestinian sources said the Abu Assab family had lived in the home for three generations since 1952. Israel's NGO peace now said that the home was originally a Jewish family who fled during the war in 1948, accompanied by the foundation of Israel. East Jerusalem was obsessed during this conflict of Jordan until the 1967 Second War when it was seized by Israel and subsequently annexed, movements never recognized by the international community. The Abu Assab family lived until 1948 in a neighborhood that fled before moving later to that home. Fred said in a statement Sunday that an Israeli law was passed in 1950 Palestinians cannot return home they fled in 1948. However, a 1970 act decreed that property in the occupied East Jerusalem left by Jewish owners could be recovered. "The court gave the settlers the home and the Abu Assab family became refugees for the second time," said peace. " There is an estimated population of about 200,000 Jewish settlers living in occupied East Jerusalem along with about 250,000 original Palestinians.